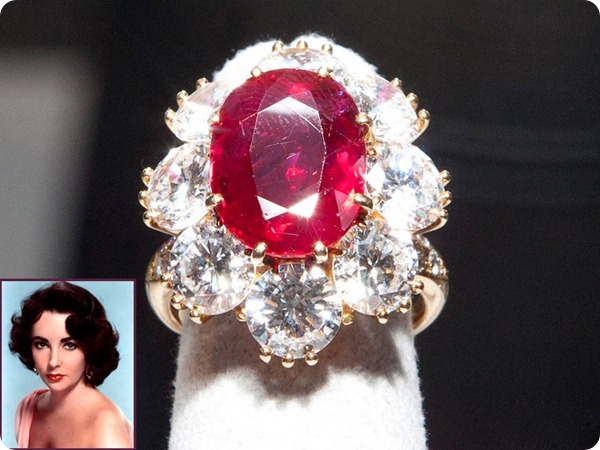 The fabulous Ruby, birthstone for July | Is This Mutton? 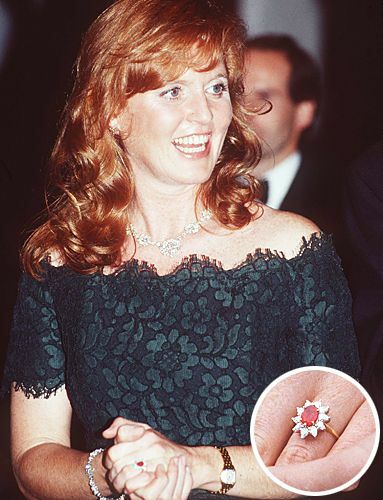 I always associate rubies with the Duchess of York's engagement ring. I wanted to learn more about this elusive gemstone. Gemporia, one of the world's largest online retailers of gemstones, has a wonderful article about the legends and history of rubies. They have long been associated with healing, with blood, and with fire. "Ruby" comes from the Latin word ruber, meaning red. Ruby is the most valuable variety of the corundum mineral species, which also includes sapphire. Corundum in its purest form is colourless: the magic is produced by a miraculous trace element, chromium. This gives ruby its iconic colour. Rubies can command the highest per-carat price of any coloured stone. This makes ruby one of the most important gems in the coloured stone market. Fine ruby glows with intense red in sunlight thanks to red fluorescence, which intensifies its red colour. The most important sources of rubies are in Asia and Africa. Historically, Burma (now known as Myanmar) was always considered to be the pre-eminent source of the finest rubies and stones have been found there for over 1000 years. But beautiful and affordable rubies can also be found in Thailand, Mozambique and Madagascar. Gemporia's Gem Marketing Specialist Dave Troth says that some of the Mozambique rubies are on par with, or could pass for, Burmese stones. "This is incredible when you take into account that these stones didn’t have the benefit of forming in marble, which is low in iron.So the chromium content is probably much higher to drive out the iron." Thai rubies offer a deeper myriad of colours leaning towards violet in tone. They tend to command a premium as Thailand is the ‘Corrundum Capital Of the World’ and the locals ask more for their material. 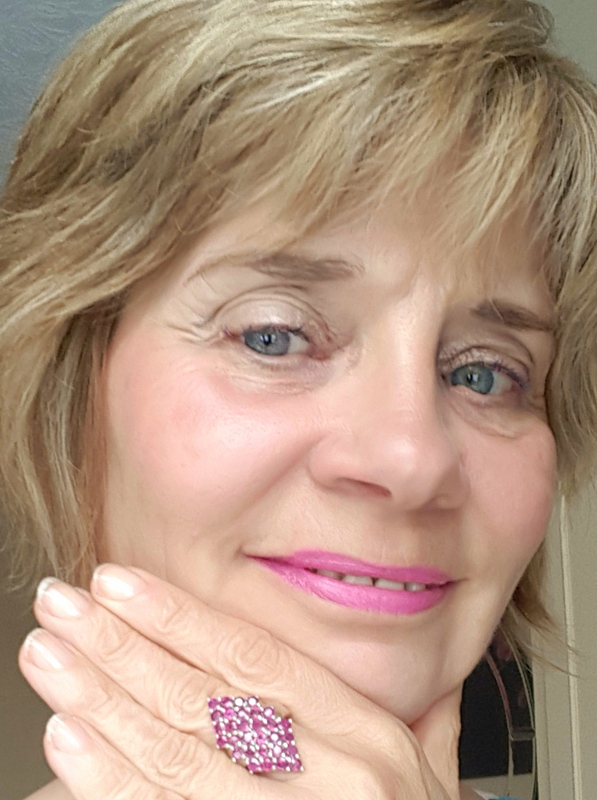 I am wearing a fabulous Thai ruby ring from Gemporia in this picture. The stones are a deep pink and the ring gets a lot of comments whenever I wear it. Mine is sold out, but this one is similar. Of Madagascan rubies, Dave says that the newer deposit from Zahamena has been compared to those from Mozambique, although some of the larger stones require treatment in the way of filling. The new generation of stones from Madagascar are distinctly different to the 2005 discovery in Moramanga which were much higher in their iron content and very dull. Top quality rubies are some of the most highly-valued gems on the planet, but there is a real range of prices on the market, from $100-$15,000 a carat. Prices depend on the quality, colour and origin of the stones. Says Dave Troth from Gemporia: "Treated rubies are usually very affordable and are a great way to spend less if you’re on a budget." Gemporia say that women are now buying more and more jewellery for themselves. 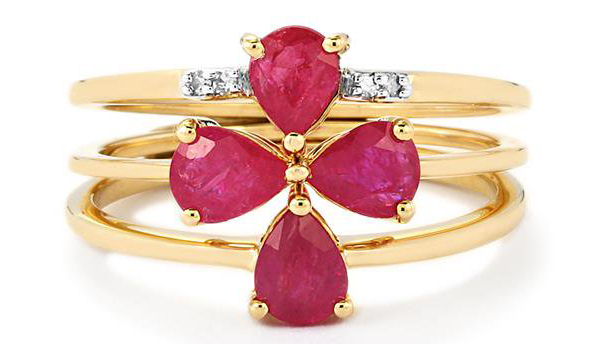 "Rubies are one of the gemstones that has increased in demand the most in the last few years. We find that ruby sales with us are more likely not to be for engagement rings," says Dave Troth. If you want to buy yourself a pay day treat, take a look at these from Gemporia. Stacker rings, as they show in their print ads, are very desirable, and the set below costs £214 here. Rubies lend themselves to gorgeous bracelets, like this one in sterling silver featuring Madagascan rubies and diamonds, priced at £428 (reduced). 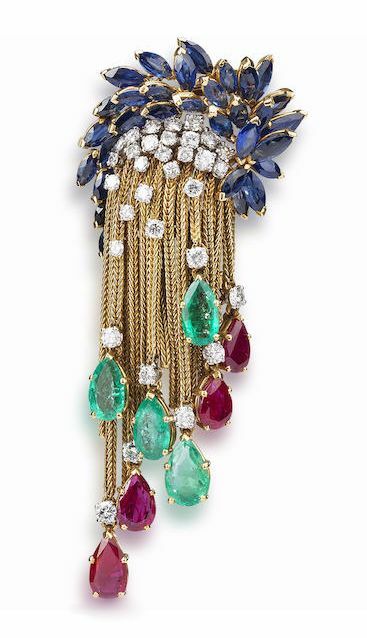 This fabulous brooch is not for sale - but isn't it to die for? Diamond, emerald, ruby and sapphire brooch, by Marchak, circa 1965. Via Bonhams. Fortunately this sparkling variety of the mineral corundum is a very tough gem. Rivaled only by diamond and moissanite on the Mohs scale of mineral hardness, this durable stone easily stands up to the rigors of everyday wear. Be aware, however, that like any gemstone, a ruby may chip or crack due to blunt impact. This is especially true when mounted in a ring or bracelet. So it's common sense to remove your ruby jewellery before gardening and carrying out household tasks. To eliminate dullness, clean rubies at home by applying a mixture of mild liquid soap and warm water. Gently scrub your rubies and the jewellery mounting using a soft toothbrush. Rinse immediately with clean warm water and dry with a lint-free cloth for sparkling results. Disclosure: Thanks to Gemporia for gifting me the ring shown in the article. My editorial is always objective and unbiased. 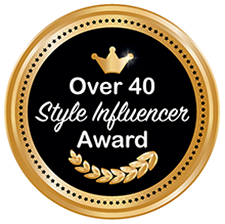 Sharing this post with Saturday Share at Not Dressed as Lamb, Jess at Elegantly Dressed and Stylish and Emma at Style Splash. The birthstone for August is the Peridot and I will be featuring this gorgeous stone early next month. Other birthstones featured so far this year: Emerald, Aquamarine, Diamond, Pearl. Is This Mutton? 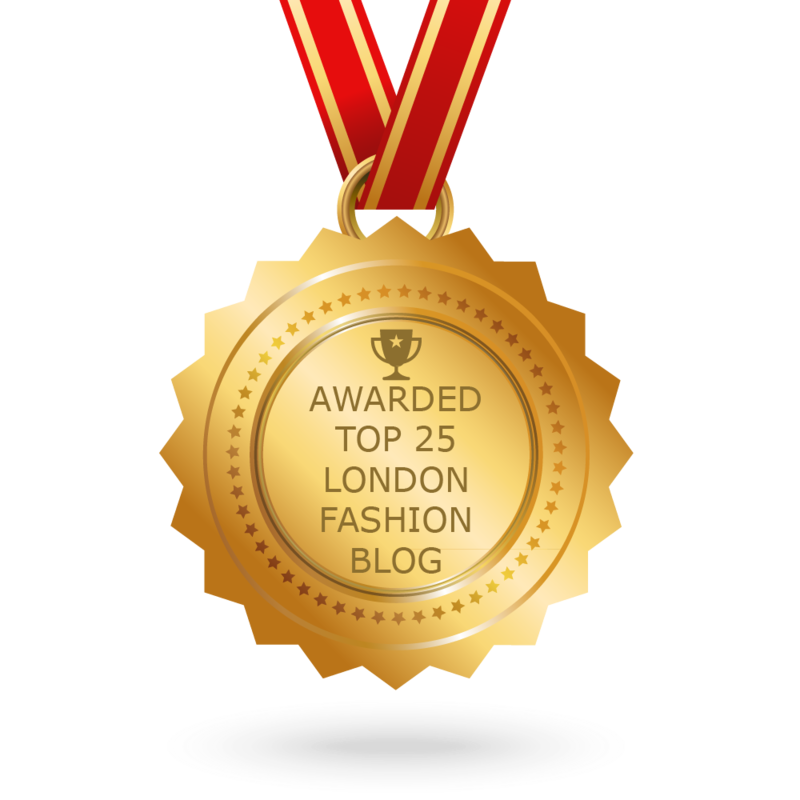 has an extensive Pinterest jewellery board. 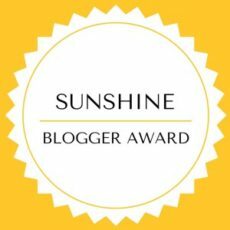 Whoo these are beautiful, I love Ruby's :) Thanks for haring at the Wednesday Blog Hop.